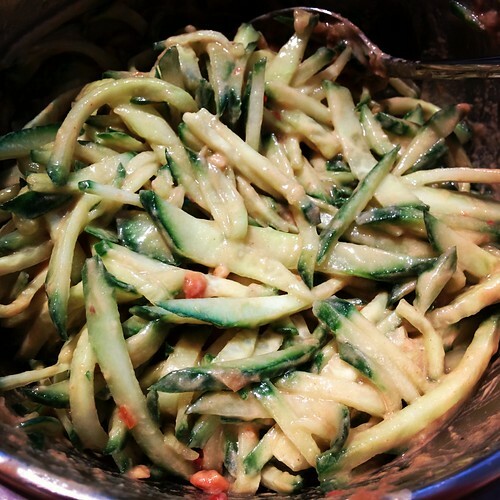 If you have been following our Instagram, you would see the photo of our homemade cucumber salad. It’s so easy to make yet it’s so delicious and refreshing. It’s great for the summer but really, you can make it anytime. Julienne the cucumber. You can pat dry it a little bit with paper towel. Put the cucumber in a large bowl. Add in peanut butter, soy sauce, Thai chili sauce and lemon juice. Mix/stir until everything is blended together. Taste to make sure you like the seasoning. Ready to serve. If you are using more than one cucumber, simply batch up the recipe. We used crunchy peanut butter, which added some crunch to the salad, but creamy PB would work just as well. The cucumber will release some liquid as you stir in the dressing, so don’t worry if the sauce seems thick at first. If you don’t have Thai chili sauce, you can replace it with Chinese black vinegar or balsamic vinegar. You will need to add some sugar to balance the acidity. If you are allergic to peanut, you can replace peanut butter with Tahini sauce (sesame based). You can also serve this (with or without the cucumber) over some cold soba noodles. Sounds delicious! We are going to try it! Great for summer, enjoying coolness and freshness of salads but we always seem to stick with the same thing over and over again, like to switch it up.